Workshop: November 5 – 9, 2018. The Conservation of Leather Bookbindings. Emory University Libraries, Atlanta, Georgia. Details below. Application info. In some respects, this structure is the end of 1,200 years of utilitarian leather binding; fifty years later, the cloth case begins to predominate. The making of the book is very organic and does not rely on numeric measuring. In many respects, this class is a hands-on explication of historic written texts. Techniques to be learned include: using a beating hammer to beat the textblock before sewing, sewing on thin raised single cords, lacing into handmade pasteboards in a typical three hole pattern, beating the boards, trimming all three edges with a plough in-boards while using trindles for the foreedge, coloring the edges with vermillion, applying vellum transverse spine liners, sewing endbands on rolled paper cores, paring and covering in full leather, marbling and burnishing the leather, and applying simple blind tooled decoration. A review of this workshop from 2016 by Constant Lem, Book Conservator at the National Library of the Netherlands. A review of this class from 2009 by Brenna Campbell for the NY Chapter of the Guild of Bookworkers. 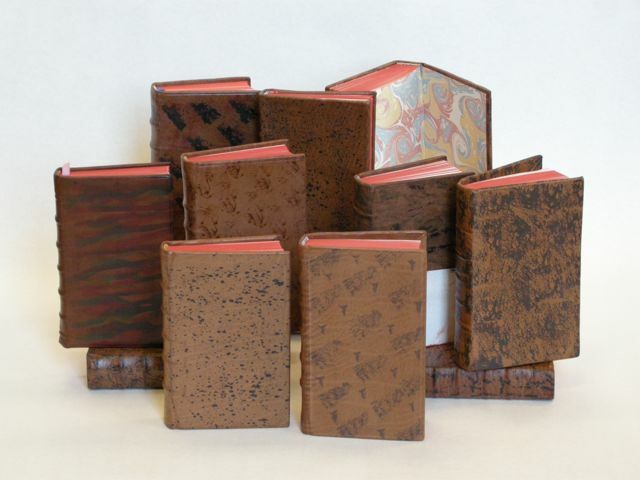 Student work from the Scrub Oak Bindery, Salt Lake City in 2007. Student work from Paper and Book Intensive, 2010. This workshop focuses on a somewhat neglected book structure, boards bindings. This class begins with examining binding structures from the late 18th century, and places boards bindings in historic and economic context. From about 1780-1830, in America, this was the most common style of binding, apart from a plain calf trade binding. It marked a departure from previous styles in its combining less expensive covering material (paper) with a laced on, or in some cases a boards that are adhered to a wastesheet, though both are covered on the book. The covering techniques are similar to leather binding. Millboard shears will be used to trim the boards, and students will have a choice of sewing on raised cords or sawn-in, with two-on sewing. We will also examine the pros and cons of why this is usually considered a “temporary” binding structure, and how it relates to the three piece adhesive case. This is a great workshop for beginners who want to be introduced to historic binding structures. A Powerpoint presentation will illustrate many styles of English and American boards bindings, as well as explore historic methods of production. One or two days. For almost 200 years, the cloth case binding has been the standard way publishers issue books. Throughout the nineteenth century, and even into the twentieth, it was often derided by bibliophiles as a temporary structure, not a ‘real’ book. However, it has proved to be a remarkably durable structure, now commonly used by conservators when rebinding books, by fine small press publications, and in library binding. Quite likely, there are more cloth cased books than any other rigid board book structure on earth. This 5-day workshop will investigate the history of the cloth case binding, concentrating on the early years, 1825-1850. We will parse historic texts that describe this structure, while paying close attention to the introduction of four key pieces of machinery: the rolling press, the board shear, the guillotine, and the stamping press. Boards bindings will be considered as an industrial precursor to the cloth case, and we will make a structural model following a technical description from Cowie’s 1828 The Bookbinder’s Manual. By focusing on historic techniques, this workshop will also serve as introduction or refresher to the essential bookbinding hand-skills. Additionally, we will explore options for conserving and repairing cloth cased books by working on actual books provided by participants. Treatment options presented will include recasing, cloth rebacking, tissue repairs, hinge repairs, and boxing. Basic paper repairs, techniques of toning tissue and cloth, spine lining considerations, and the lifting of fragile material will be addressed. Discussions will include treatment decision making in relationship to specific institutional needs or the desires of private clients. This workshop is open to all levels of experience: pre-program students, technicians, and mid-career conservators who desire a full time week at the bench. Ideally, a variety of participant experience levels will result in an invigorating exchange of information on binding techniques, institutional protocols, and treatment approaches. Students should bring 5-10 non-valuable cloth cased books that can be sacrificed or repaired, and basic bookbinding tools. Students should submit a resume and a brief one paragraph application statement, reviewing their background in bookbinding, book conservation, or other crafts, and stating what they hope to learn. This workshop introduces students interested in Book History to the material, technological and structural aspects of Bookbinding. A presentation will explicate the techniques, tools, and sequence of European binding for printed books, ca. 1450-1850. Models of key bookbindings will be provided for handling, examination and discussion. These include a 15th c. German wood board binding, an 18th c. French binding, a 19th c. Publishers’ boards binding, and a 19 c. cloth case binding. Students will make a book (folding, compressing, sewing on raised supports, lacing, etc.) 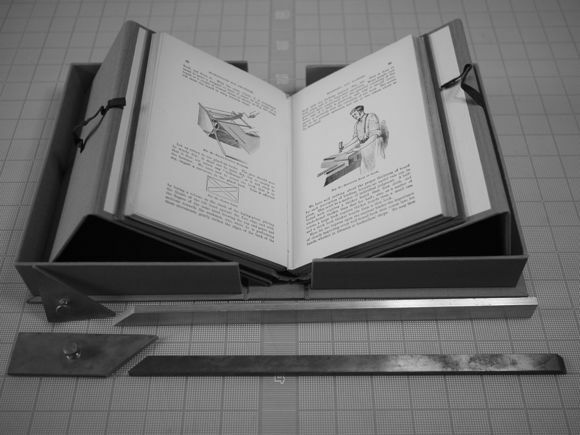 in order to gain hands-on understanding of the techniques of bookbinding. No special equipment is necessary, this can be held in your classroom, 3 hours. This class is an intensive one to three day introduction to one of the most basic human tool making activities- making and keeping an edge tool sharp without the use of jigs. Participants will be provided the materials, instruction and equipment to make several knives of their choosing, and to sharpen any type of edge tool they bring with them. The specific tools of bookbinders will be examined: paring knives, lifting knives, scissors, hole punches, spokeshaves and board shear blades. A wide variety of sharpening systems will be available for comparison: water stones, ceramic stones, diamond stones, oil stones, natural stones, silicone carbide powder, aluminum oxide powder, diamond paste, abrasive papers and stropping compounds. Some basic principals of tool steels will be explained, and edge geometry investigated. Machines for shaping metal will also be used: stone grinders, belt grinders, belt sanders and the Tormek. The goal is to free participants from the plethora of misinformation and mystique that surrounds sharpening and to instill confidance in sharpening and resharpening bookbinding knives. One day version: Sharpening from a factory grind, resharpening, knife maintenance. Review of the workshop. Two day version: The above and making two knives from scratch, either by hand or possibly on grinding machines. Three day version: The above and spokeshave modification. Possible additional topics: handles, drilling, tapping, simple wood shaping, planes. The New England Chapter of the Guild of Bookworkers review of this workshop. Review from ICON Conservation Newsletter, November 2010. The cloth covered drop spine (aka. Clamshell) box is the standard for protection of rare books. Having an integral cradle adds another level of preservation and presentation, making it ideal for artist books or even a suite of prints. This workshop focuses on learning traditional boxmaking skills—how to accurately and easily measure, cut, glue and assemble a drop spine box with an integral cradle. This construction method will emphasize the use of jigs and other non-numerical methods of measurement. The first day will be devoted to learning the basic techniques of working non-ferrous metals such as aluminum and brass. Using hand tools, basic shaping, filing, drilling, tapping, sawing and finishing will be taught in order to make permanent jigs. A box making triangle and trimming jigs will be constructed. Techniques for the efficient production of the same and different sized boxes will be taught. Participants will construct a one-piece cradle and box, which was invented by Peachey and announced in a blog post:https://jeffpeachey.wordpress.com/2009/10/27/drop-spine-box-with-an-integral-cradle/. If time permits the pros and cons of other models drop spine box with cradle constructions will be examined. Two or three days. Until around 1500, most books were bound in wooden boards. Books with wooden boards lie somewhat outside the routine treatments book conservators are normally tasked with. Split, and splitting wood boards are a tremendous problem in many institutions–they put many other aspects of a binding, especially intact covering materials, at risk of further damage if not stabilized or otherwise treated. This five day master class will focus on the fundamentals of the treatment of wooden book boards: the basics of using hand tools to shape wood accurately, easily and efficiently; the making a sample set of woods commonly used for wood boards; the examining of historic techniques for fabrication; and the making a sample set of common treatments for split boards. Choosing, tuning, using, sharpening and maintaining woodworking tools will also be taught. Exploring some of the complexities of wood technology and how this impacts treatment, storage and handling options for conservation treatments will also be covered. No previous woodworking experience is necessary. Five days. Discuss treatment considerations based on documentation that participants supply. One to three day workshops are designed to provide an overview of the set-up, use, adjustment, and maintenance of the Peachey Board Slotting Machine. Longer workshops also include experimenting with various types of slotting, discussion of material selection, advanced board slotting structures, and more. One to three days. 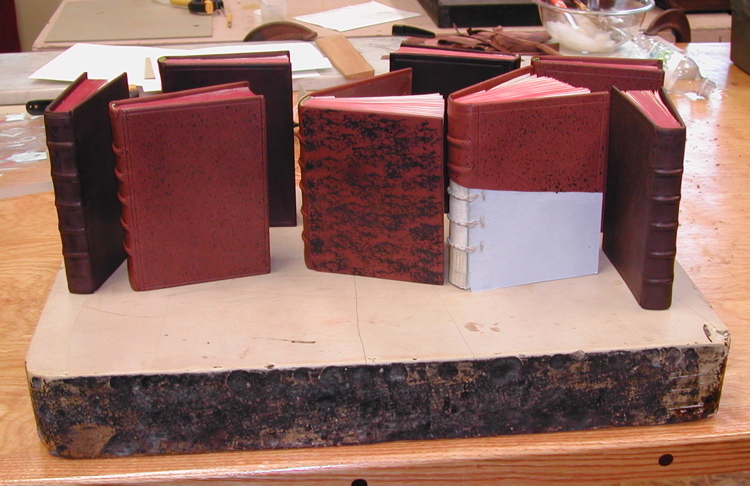 I am Looking for instruction/apprentice situations for developing antiquarian bookbinding here in North Carolina. Do you have any upcoming courses or recommendations? Jeff, do you keep a list of people to notify when a workshop is scheduled? I’d like to know about any upcoming Making and Sharpening Knives workshops. Don’t know if they’ll fit into my schedule but I’d sure like to attend. I was wondering how might we tempt you in coming to Melbourne, Australia to run some of your workshops?? Do you teach any classes on clasp making? If so, would you add me to your list of those to notify when you schedule one? Thanks. When will you have a workshop in Germany? Maybe someday? I’d love to, but would need an institution or workshop to host it. Any ideas? Will you be doing a one or two day knife workshop soon? Southeast preferred but travel possible. Have some skills with tools. Specific interest is lifting knife. I post all upcoming workshops open to the public on this page, nothing scheduled at the moment. There has been some preliminary discussion with the Guild of Bookworkers doing something in the Atlanta area, but nothing set.